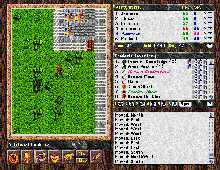 Exile is a single-player RPG shareware, similar to the old Ultima series in design and appearance, has persisted for years, despite the newer pseudo 3-D creations like Diablo. The Exile series (now being updated to the Avernum series) by Spiderweb Software presents as rich of a story as any commercial RPG in existence. You can become lost for hours at a time in the story as you attempt to win freedom for an oppressed society. Blades of Exile (BoE) carries the series forward by allowing individuals to create their own custom scenarios in the Exile style. There are now over 120 scenarios available for BoE, and a strong community to support them. The BoE community runs contests several times a year to encourage new development. The BoE editor allows individuals to test their abilities as a game designer, to tell a good story, and to create as opposed to just consuming. It may well be that the creative capabilities of BoE foretell the types of interactive fiction we will experience in the future. Some amazing ancillary developments that tie into BoE are huge graphic archives that could be using in any RPG setting, rubrics for scenario development and judging, and reviews of existing scenarios. But perhaps the most amazing thing about BoE is the persistence of its users/developers. BoE first appeared in 1997. Unlike many other gaming communities that exist for a year or so then fade away, BoE's community continues to grow and evolve. Check out the BoE Webring for starters, and related sites below. Despite—or perhaps because of-- tremendous advances in “bells & whistles” aspects of RPGs, the Exile series and Blades of Exile are classic designs that are worth looking at again - not because of the technology involved, but because there's something magical about them that permits them to continue to grow and change, to attract new community members, and to carry a humble RPG far past its original limits. Note from Underdogs: We are honored to have Brett Bixler, one of the most avid BoE fan and scenario designers, review this great game :) Visit his excellent site below!